Lizards Mouth Imperial Double IPA | Figueroa Mountain Brewing Co. Girlfriend brought me a growler from her trip to Santa Barbara. Fig Mountain seriously knocked it out of the park on this one. A: Poured into a Fig Mountain shaker pint. Pours a light straw color with a thin white head and a nice lacing on the glass. A friend was drinking Bud Light and we compared the two in their glasses. They were almost identical in appearance with the Lizard's Mouth being just a touch darker. I expected darker and heavier and it threw me off a bit. S: Fresh, fresh, fresh citrusy hops. Smells like walking through the central coast vineyards on a spring day with a glass of beer to keep you company. There are some fruity notes and a touch of something almost earthy or woody, but these aren't very pronounced. The hops take center stage here with the fruit tartness coming into play far more in the taste than the aromatics. T: How they managed to make a 9.2% double IPA taste this clean and smooth is beyond me. I'm expecting a monster tornado of hop-packed bite, and instead I'm greeted by one of the most easy drinking beers I've ever had. There is plenty of bright bitter hops, but they're balanced by just a bit of citrus fruit twang that lead to a clean and dry finish that left me ready to drink more. M: I've heard people complain that they only like "clean" tasting IPAs and sometimes had trouble understanding what that meant. This is a great example of that. The flavor lingers, but doesn't make you feel like your mouth is coated in straight hop oil. The carbonation isn't aggressive, but it's present such that this beer wouldn't feel out of place in a wine glass or champagne flute. This is one you could drink all day if you can handle the high ABV. O: I didn't expect Fig had it in them to blow my socks off like this. This is an IPA with gold-medal potential that still manages to stick to the brewery's tradition of making beers that are easily enjoyed by both seasoned beer geeks, and buyers of cheap 30-packs alike. Really, really hope they consider bottling this one. It's delicious! Thank you Fig Brew! By far the best beer to come out of Santa Barbara. So smooth, balanced, beautifully hopped, no harsh alcohol (it's nearly 10%) and just incredible fresh pine/tropical fruit/grapefruit aroma and flavor. S: Like Alpine Nelson and Enjoy By had a baby. Just clean, fresh mango/pineapple/citrus and pine. T: Tropical fruit punch, some grapefruit, pine , some light grass (think the resiny part of a fresh hop beer), some Sauvignon blanc notes here as well. Quick trip to Westlake Village. Pretty, hot. a) Pure clear golden body, with lazy carbonation, and fast fading head, not much lace. s) Tropical and orange marmalade hops on nose. t) Follows aroma. Better, bigger, and more fragrant and interesting. Good marks on taste. Sharp and nice finish. Bitterness overcomes sweetness. f) nice wine like astringency in the end, but not the first beer of the evening. A: Dim caramel amber colored body with some well conditioned filtering. A densely formed mass of off white foam capped over top. Good retention efforts noted. Lots of messy webbed lacing scattered across the glass. S: Juicy sweet ripened apricot with some nuanced citrus mesh into a danky pine resin note. I get quite a bit of malt sweetness to this one as well. Has a caramel and honey graham cracker likeness to it. Not bad at all with the hops up front but definitely toting a bigger malt bill it seems. T: Sappy pine with citrus, peach, and apricot comprising most of the hop flavor here. Assembled over a hefty malt bill of honey cracker and a touch of Crystal sweetness. The beer has a relatively high level of intense bitterness that bites at the palate midway. Finishes out with a flurry of tropical like flowers. Alcohol seems well in balance here and overall this is pretty nice. M: Moderately filling on account of the malts. Nice smooth consistency provided by the carbonation. Big scrubbing bitterness across the palate that drives into a lighter drying finish. Slightly resinous with a long lasting hop bitterness. D: A nice brew but not quite up to par or perhaps my bottle was old. Was excited to finally give this one a try as I am a fan of Figueroa but this didn’t quite meet expectations. It’s alright and with some nice flavor and balance but there are dozens of better options available to me these days. That said will definitely have again and hope to find fresh on tap some time. 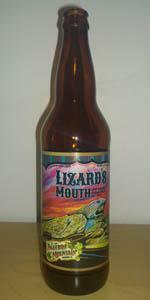 Lizards Mouth Imperial Double IPA from Figueroa Mountain Brewing Co.